Our first chicks have hatched!!! Little Terns incubate their eggs for just 21 days before they hatch, so we knew that our first babies were due yesterday. Sure enough, when we went out into the colony to carry out our daily nest checks, we found three nests with tiny chicks hatched just a few hours previously. Some of them were so freshly hatched that they were not yet dry. This little guy still had bits of his egg shell attached. We were lucky enough to come across one chick in the midst of battling from his shell. His younger sibling had also just managed to break a hole in his shell with the egg tooth on the end of his bill. This falls away after about a day. As soon as the chicks have grown enough, we fit them with a metal ring with has a unique identifying number on it. This helps with our research, as it means that individual birds can be tracked, which gives us information about their foraging movements and migration as they get older. Throughout the summer we will also take measurements of their wing length and weight so we can understand more about their growth rates and development. 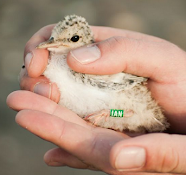 When first hatched Little Terns weigh around 7 grams and have wings just 11 or 12 millimetres long. So tiny!! !